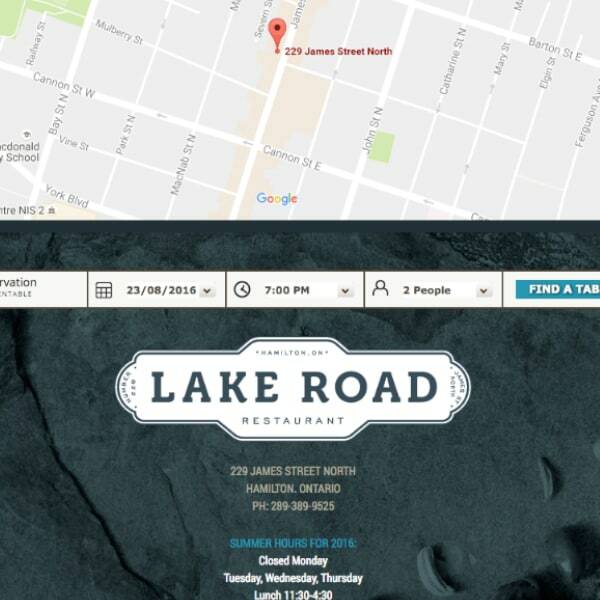 Lake Road Restaurant approached us to create a brand new website for their new restaurant opening in downtown Hamilton Ontario. To complement the visual aspect of the decor, tones and colors of the physical location, we opted for a clean parallax design to give visitors a simple and easy way to access the menu and learn more about the restaurant. One of the main requirements early on in this project was that the client wanted to be able to easily make changes to the site themselves. As with most restaurants, the menu changes often along with regular specials and promotions. A common complaint we hear is that the client is unhappy with having to go through an agency in order to make small minor changes to the site content. WordPress is often a CMS of choice because of the widespread ease-of-use as well as extensive documentation and how-to videos for anyone to easily pick up and understand how to make changes. Fill out the form below to get a free consultation. At Shift8, we cater to all sorts of businesses in and around Toronto from small, medium, large and enterprise projects. We are comfortable adapting to your existing processes and try our best to compliment communication and collaboration to the point where every step of the way is as efficient as possible. Our projects are typically broken into 5 or 6 key "milestones" which focus heavily on the design collaboration in the early stages. We mock-up any interactive or unique page within your new website so that you get a clear picture of exactly how your design vision will be translated into a functional website. Using tools like Basecamp and Redpen, we try to make the process simple yet fun and effective. We will revise your vision as many times as necessary until you are 100% happy, before moving to the functional, content integration and development phases of the project. For the projects that are more development heavy, we make sure a considerable amount of effort is spent in the preliminary stages of project planning. We strongly believe that full transparency with a project development plan ensures that expectations are met on both sides between us and the client. We want to ensure that the project is broken into intelligent phases with accurate budgetary and timeline breakdowns. Approved design mock-ups get translated into a browse-ready project site where we revise again and again until you are satisfied. Client satisfaction is our lifeblood and main motivation. We aren't happy until you are. © 2019. All Rights Reserved by Star Dot Hosting Inc.